Looking for a great Christmas gift for the child on your list this year? Instead of getting them this season’s trendiest toy or video game, why not give them a space where they can let their own imaginations come to life? At Amish Barn Company, we offer handcrafted playhouses in several different styles that are perfect for children of all ages. Choose from a classic Victorian play house, a charming Cape Cod or even a playhouse that mimics the appearance of an old one-room schoolhouse. These structures can even be outfitted with details like chimneys, porch swings, coach lamps and more. We strive to make all of our Amish-built playhouses as true to life as possible. 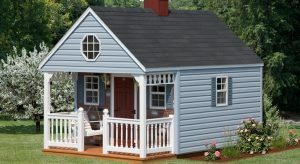 These playhouses offer a safe, cozy space where your child can form cherished memories that will last a lifetime. During the winter, when your child may not be able to spend much time in their playhouse, these structures can also serve as valuable temporary storage options. Each of our playhouses features an adult-sized door in back that can accommodate things like outdoor furniture and tools you might want to keep inside when it’s cold and snowy out. Once spring returns, just take these items out and your child will be able to enjoy their playhouse again. All of our playhouses are also eligible for our popular rent-to-own option. With no credit check and prices starting at just $73 per month, this program provides a convenient, affordable way for our customers to finance many of our Amish-built structures. As always, we also offer free delivery anywhere within 100 miles of our location in Oneonta, New York. To learn more about the playhouses we build at Amish Barn Company, feel free to give us a call or contact us online today!